A broken tooth is a dramatic event that will leave you looking unsightly and feeling self-conscious. If you break or chip a tooth, do not assume it is impossible to rectify the situation. Our dentists can help. Here is a look at the many ways a dentist can repair your broken tooth. A crack in a tooth that moves below the gum line is a candidate for a dental implant. A tooth that is beyond treatment is also a candidate. We will extract the damaged tooth and place a dental implant in the gap. The implant functions as the tooth's root and remains securely in the jawbone for a comfortable and lasting fit. A veneer is a cover for a problematic tooth. We bond a veneer to the front portion of the tooth, transforming the tooth's appearance while also providing considerable stability. With proper care, the veneers will last upwards of three decades. It is possible to position veneers on a single tooth or several problematic teeth. However, it is crucial to avoid grinding teeth or one will wear down the veneers. Dental bonding is one of the top remedies for repairing chipped or broken teeth. Bonding has the potential to last upward of an entire decade. We quickly roughen the tooth, then place a conditioning liquid and apply the putty. An ultraviolet light hardens the composite. We then shape and polish the bonding after drying so it matches the remaining portion of the tooth. If a crack extends down into the pulp of the tooth, it is possible to treat it with a root canal. We can position a crown to stop the crack from spreading following this procedure. A patient will use a temporary crown in the meantime. A badly-chipped tooth or a tooth that causes pain when drinking/chewing, might require a crown. A dental crown is a common treatment for restoration. It covers the tooth for protection and also enhances its appearance. The crown serves as a robust covering for the tooth. This way, the dental crown protects the damaged tooth so it can withstand the pressure from the chewing process. Crowns consist of porcelain that resembles natural teeth that we can use to make a patient's smile look uniform from all sides. This is the happy and presentable appearance you need to feel confident. Let our dentists transform your smile, repair your broken tooth and make you that much more comfortable in the presence of others. 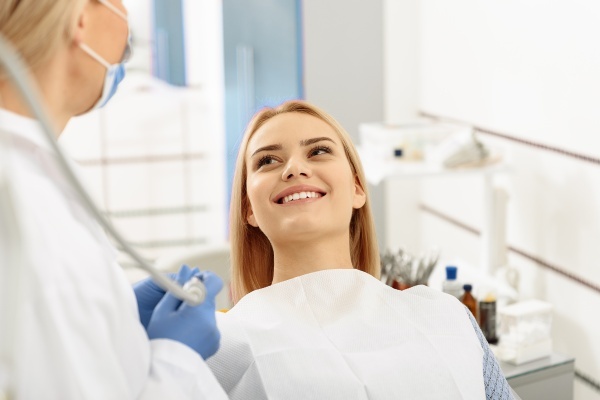 By seeking professional treatment from us, you will be able to have a fully-functional and natural-looking smile. If you have a broken or chipped tooth, let our dental professionals take care of it. We will inspect the damage, determine the best course of action and keep you as comfortable as possible throughout the entire process. You do not need to continue struggling with the pain or uncomfortable dental issues. Reach out to us today to schedule an appointment.